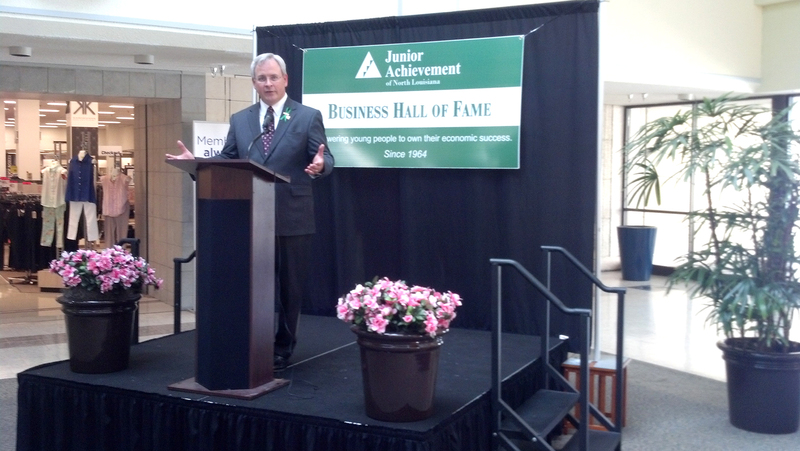 BPCC Chancellor Dr. Jim Henderson speaks during the Junior Achievement of North Louisiana’s Business Hall of Fame announcement Wednesday at Mall St. Vincent in Shreveport. Bossier Parish Community College Chancellor Dr. Jim Henderson has been chosen for the Junior Achievement of North Louisiana’s 2013 Business Hall of Fame. The announcement was made Wednesday morning at Mall St. Vincent in Shreveport. Other Laureates chosen for the 20th class were Linda Biernacki and Lacy Williams, MD. “As a mother, you want to see what opportunities your children are going to have to become a responsible adult to have a happy life, their family, and have what we have. Jim Henderson makes these opportunities available to students,” said Nita Cook, President of JANLA. Williams was Chief of Radiology at Schumpert Medical Center and helped form Will-Drill Resources. Junior Achievement is an international organization that uses volunteer business professionals to educate children about financial literacy and economic success. “When you think about the mission of Junior Achievement, what more noble pursuit is there than to prepare young people to take charge of their futures?” Henderson asked. Scott Auer, JANLA Chairman of the Board, has shared gus business experience with young people in the classroom for 11 years. Jim Fritze shared his memories of helping launch Junior Achievement 50 years ago.